Starbucks is continuing its shift to more driver-friendly stores in Kitsap with a proposal for a new location on Highway 305 in Poulsbo. 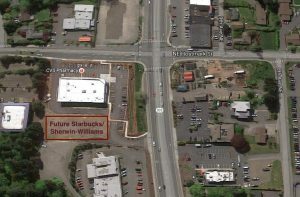 The city received a permit application earlier this month for a 2,000-square-foot Starbucks coffee shop with drive-thru and 4,000-square-foot Sherwin-Williams paint store on a site adjacent to CVS, just north of Hostmark Street. A site layout submitted to the city shows two standalone buildings. The Starbucks would be on the west side of the site, closest to the highway. The paint store would be situated on the east side. 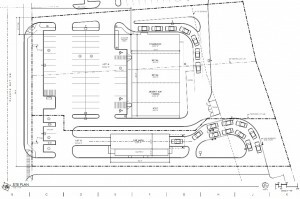 The drive-thru lanes would separate the buildings. The applicant is PacLand Seattle, which has developed a number of retail centers in Washington and Oregon. Starbucks has been busy in Kitsap of late. The Seattle coffee giant recently added stores with drive-thrus in Silverdale, Kingston and Poulsbo’s College Marketplace. Starbucks relocated stores to the new buildings in Silverdale and College Marketplace. The proposed Highway 305 shop seems well positioned to replace the existing Starbucks in Poulsbo Village, near the recently-abandoned Albertsons. Sherwin-Williams has outlets in Silverdale and Port Orchard. The company came close to placing a store in College Marketplace in 2011, but the deal was stalled by development restrictions negotiated by Walmart and Home Depot, according to court documents filed in a related lawsuit. Kingston ferry commuters have a new coffee option. Starbucks opened a store with drive-thru Monday next to Rite Aid on Highway 104, east of the Miller Bay Road intersection. The café has seating for 50 and will employ 19 “partners,” according to a company spokeswoman. Store hours are 4:30 a.m. to 8:30 p.m. daily. 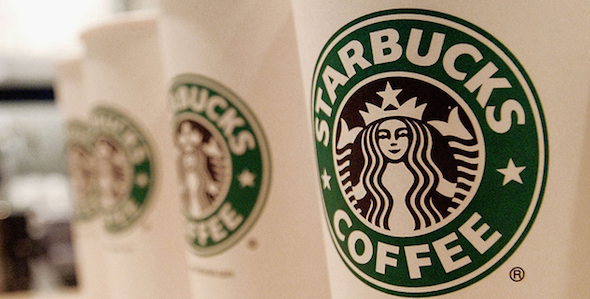 New Starbucks stores have been popping up all over the county in the past year. The first standalone Starbucks on Bainbridge Island opened in 2014, along with a Wheaton Way location in Bremerton. 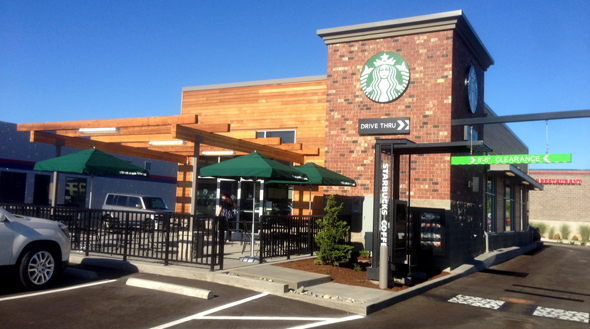 Starbucks added a store and drive-thru at Silverdale Way and Bucklin Hill Road in July. Another is planned for Poulsbo’s College Marketplace. The opening of the Kingston café brings the county’s Starbucks count to 21 (including Starbucks kiosks inside larger stores). Kitsap is in line for yet another new Starbucks store. 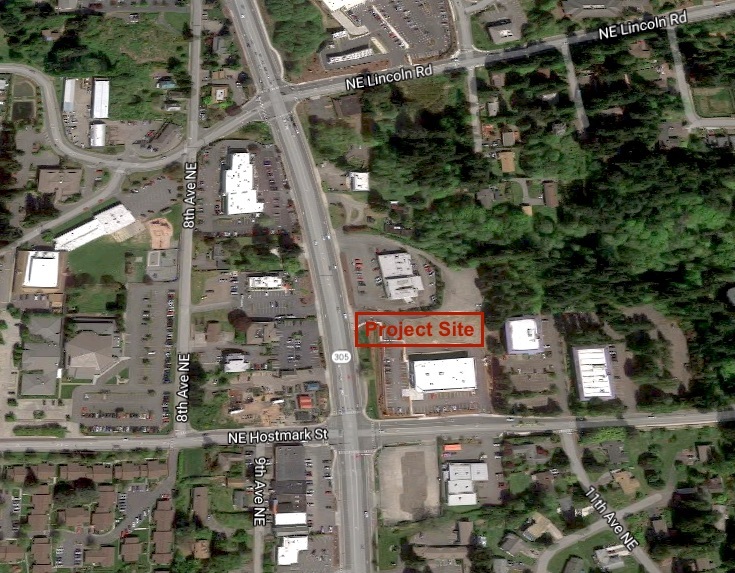 The Poulsbo planning department recently approved an 8,500-square-foot retail building and 2,700-square-foot car wash on Olhava Way, across from Walmart. A Starbucks store with drive-thru will occupy about 2,000-square feet of the retail building, according to a 10-year lease agreement recorded with the county last week. Starbucks already has a store in the College Marketplace commercial center, so this could be another case of relocation. The Seattle-based coffee giant has been busy in Kitsap lately. Starbucks opened a new Kitsap Way store last year, followed by a new Bucklin Hill location in July. Another Starbucks is under construction on Highway 104 in Kingston. All of the new stores have drive-thrus. The site plan for the Olhava Way development lists AT&T and Desert Sun Tanning as additional tenants for the retail space. Like Starbucks, Desert Sun has an existing College Marketplace location. There is already a big wrinkle for the development plans. A large swath of vacant land in College Marketplace, including the two Olhava Way parcels proposed for the retail and car wash buildings, are set to be auctioned in a foreclosure sale in October. Want to know when fresh content is posted to the Minding Your Business blog? Sign up for email alerts using the widget on the right-hand side of this page. Starbucks giveth and Starbucks taketh away. A new Starbucks store with drive thru opened early Wednesday morning near the northeast corner of Silverdale Way and Bucklin Hill Road. The previous Bucklin Hill location, next to Haggen, has closed. 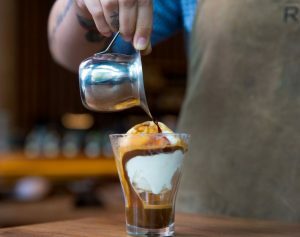 “Starbucks is always looking for great locations to better meet the needs of our customers,” a spokeswoman for the coffee giant said in an email. Construction began this spring on the new 2,400-square-foot shop, which shares the corner with IHOP and Little Caesars Pizza. The spokeswoman said the store will feature Starbucks Reserve, Starbuck’s line of small-batch roasted coffees. 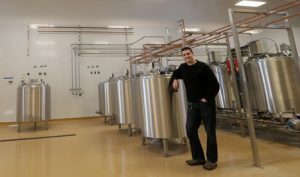 The location is also equipped with a Clover Brewing System. The store has a staff of 28. With one store closing and another opening, Silverdale’s Starbucks count remains at three. A second store is located farther north on Silverdale Way. The third is inside Safeway. Silverdale isn’t the only Kitsap town getting a new Starbucks. A store with drive thru is under construction in Kingston, at the corner of Highway 104 and Miller Bay Road, next to Rite Aid. A coffee shop planned for Kingston will feature a familiar mermaid logo. A permit application has been filed for an 1,800-square-foot Starbucks store and drive-thru near the intersection of Highway 104 and Miller Bay Road, according to county records. The store will be part of a retail complex we reported on back in March. 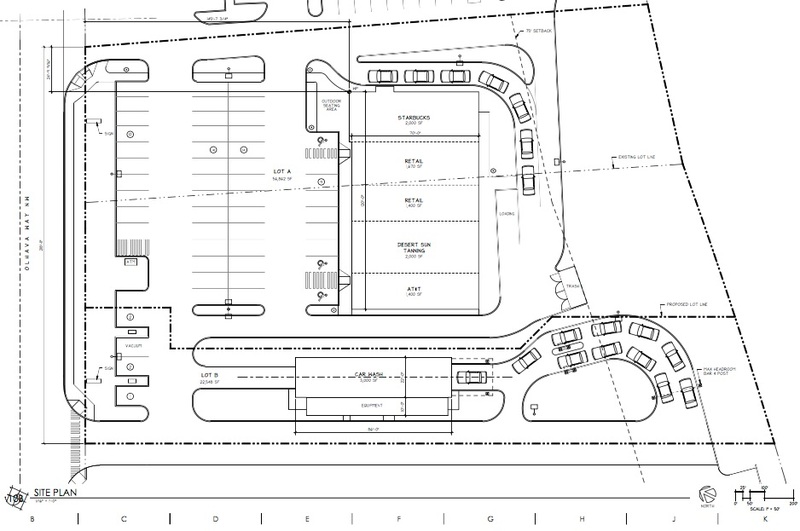 The development is planned for an undeveloped parcel next to Rite Aid. The site should position the coffee shop to take advantage of busy commuter traffic. The Kingston property is owned by a developer who is also bringing a Starbucks store to the corner of Silverdale Way and Bucklin Hill Road. When the newly-rebuilt Kitsap Bank branch in East Bremerton opens Monday longtime customers may recognize a familiar face. John Glomsted, the manager who opened the original branch in 1961, will serve as the honorary first customer. The new campus, at 3425 Wheaton Way, is set for a 9 a.m. soft opening. The Starbucks coffee shop integrated with the bank is expected to open later this month. A grand opening for the campus is scheduled for Aug. 8. Kitsap Bank Marketing Director Shannon Childs said contractors are putting finishing touches on the 5,000-square-foot building (about half of the space is dedicated to the coffee shop). A solar array is still being installed. The glass-sided structure includes drive-through windows for both banking and coffee. Kitsap Bank emphasized recycling and the use of reclaimed materials during demolition and construction. The new branch will also feature new technology, including automated cash counters and tablet computers. Special equipment available for business customers will be on display. Childs said the Port Orchard-based bank is looking forward to renewing its presence in East Bremerton. The old Wheaton Way branch was demolished in May. (This post was corrected to reflect John Glomsted’s role in the opening). A grand opening for Poulsbo’s Safeway store and gas station is now set for June 27. Safeway spokeswoman Sara Osborne said the 59,000-square-foot store at Lincoln Road and 10th Avenue will have about 160 employees. Of those, 120 will be new hires. The company refers job seekers to its website for application information. Osborne said the store will have all the accustomed Safeway departments, including produce, natural and organic foods, a bakery, floral kiosk, videos, and pharmacy. The deli will feature sushi, sandwiches, a China Express, an olive bar and a soup bar. Seating for the deli is situated by windows with views to the west and south, alongside an indoor fireplace. Outdoor seating will be available at the front of the store. A Starbucks coffee shop and US Bank branch are integrated into the building. The gas station has 10 pumps. Safeway was a featured sponsor of Poulsbo’s Viking Fest last weekend and is sponsoring the Third of July celebration, Osborne said. Construction began on the store in early 2013 with an opening originally planned for December, and later projected for May.